Advantages: Knowledgeable authors, wide variety of subject matter, 1:72 scale general arrangement drawings, colour profiles; industry news and reviews. Conclusion: A magazine that contains a diverse assortment of subject matter specifically aimed at the WWI model aeroplane enthusiast. 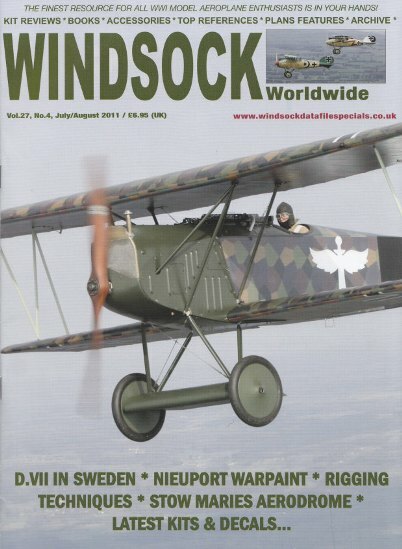 Windsock Worldwide is an A4 sized magazine that caters specifically for those interested in WWI aviation. Inside are 32 pages crammed with a wealth of information on a broad range of topics. Lance Krieg continues his popular “Modelling Master Class” series and this time it’s part 2 of a detailed look at struts and rigging techniques. There are plenty of photographs; in fact nearly 50 are spread over the assigned 6 pages. A multitude of close-up photographs give the reader an excellent insight into the various methods discussed. “Rara Avis” looks at some of the more unusual aircraft designs thanks to general arrangement drawings from the Ian Stair archives. This issue presents Felixstowe’s Fury, a multi-engined triplane flying boat from the design book of John Porte. Only one was ever built but it did fly successfully on a number of occasions. As always a double page spread of 1:72 scale planes accompany the article. “Great War Paint” #2 takes a timely look at the Nieuport 24bis and its variants. This second installment displays nearly a dozen aircraft, all beautifully rendered over a double page spread. The foreign examples portrayed here make a welcome change for those wanting to model something a little different. It’s a much welcome piece of inspiration for decal manufacturers and builders of the latest Roden releases. Marat Khairulin continues the story of Halberstadts in Russia. Complimenting the article is the able work of Aleksandr Kazakov as he presents a profile of a D.V attached to 2nd Army Air Detachment in Spring 1917. From the workshop of Mike Carlson we see another of his fine WWI replicas take to the air. This time it is the Fokker D.VII, which is built to original specifications and is even powered by an authentic 200-hp Mercedes D.IIIa engine! Colour photos accompany the article which includes the obligatory cockpit areas. Ray Rimell visits Stow Maries in Essex to report on the restoration of a genuine WWI aerodrome. It was the home of No.37 Home Defense Squadron which attempted to counter the threat of incoming Zeppelin and Gotha raiders. Fans of R/C aircraft get to marvel at Ray Williams’ 1:3 scale Vickers FB5. His “Gunbus” features a working miniature version of the Gnome rotary engine and the author gives the reader a rundown of its operation. A dozen photos accompany the article which includes close-ups of the aircraft as well as a selection of components from the power plant. Rounding out the publication are 6 pages of reviews that cover kits, books, decals and accessories.